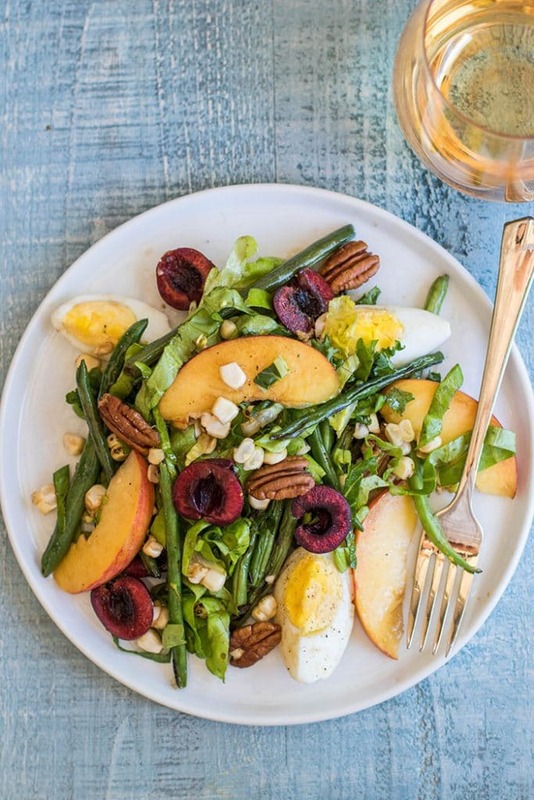 This Mid Summer Dream Salad is a celebration of summer produce– green beans, corn, cherries and peaches are the stars of the show, but some boiled egg and pecans add interest and some protein. For those hot summer nights when you need a cooling meal! Big salads are my favorite meal — if you’ve been reading for a while, you know that! I have big salad creations on here more than any other type of food. They are such a great way to pack in the nutrients! When I am not feeling my healthiest, especially after indulging in too many sweets, or after traveling and having to make do with restaurant offerings for too many days, I crave salads. 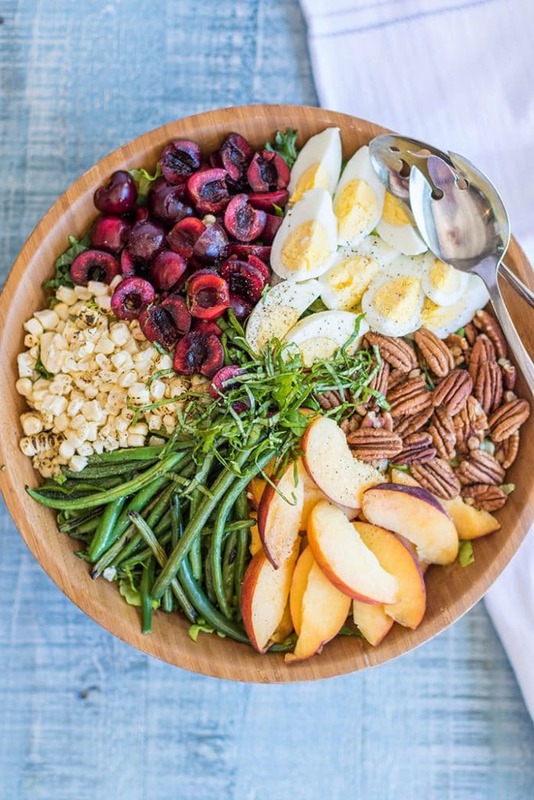 Give me a huge bowl of greens piled high with fruit, veggies and nuts. Does anyone else get peeved when they order a salad out and get more cheese and croutons than lettuce? Any serious salad lover knows that the best salads are made at home, by someone who appreciates ALL THE VEGGIES! My favorite go-to salad dressing is a simple blend or olive oil, balsamic vinegar and lemon juice. I use it all the time. This salad is so packed with flavor and texture, I knew I needed to keep the dressing super simple. The summer produce really shines here and doesn’t need a complicated dressing overshadowing it. The other evening we went for a walk, and came home to a warm house from the recent heat wave, and this salad ready and chilled in the fridge. Absolutely perfect to enjoy on the back patio with a delicious glass of white wine.So summery and fresh, and so cooling. I had planned on making this salad with my favorite crunchy romaine lettuce, but when I cut into the last head, it was going bad. Instead, I used some curly kale finely chopped mixed with some shredded butterhead lettuce. It was perfect. These salad toppings will work on any greens base you choose– chop up some lacinato kale, use a bag of spring mix, even peppery arugula would be amazing in this salad. 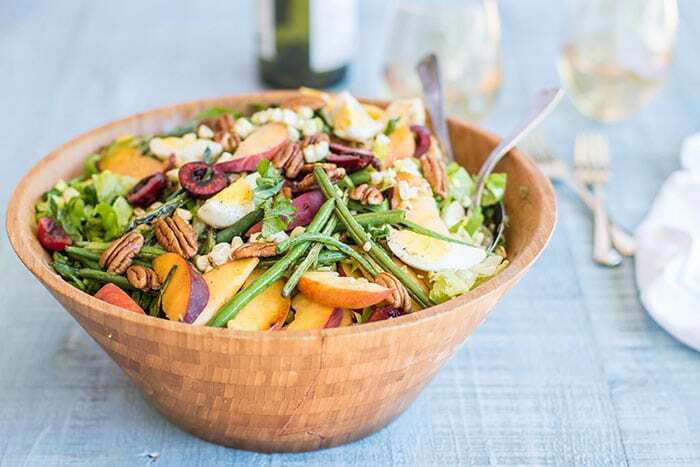 Make it Ahead: Make this salad ahead of time by leaving off the dressing a pecans until ready to serve. Make it Paleo/Whole30: This salad makes a perfect Whole30 summer meal if you omit the corn! Heat a frying pan over medium high heat. and add the olive oil, green beans, and sweet corn. Saute until the beans and corn are heated through and have some charred color to them. 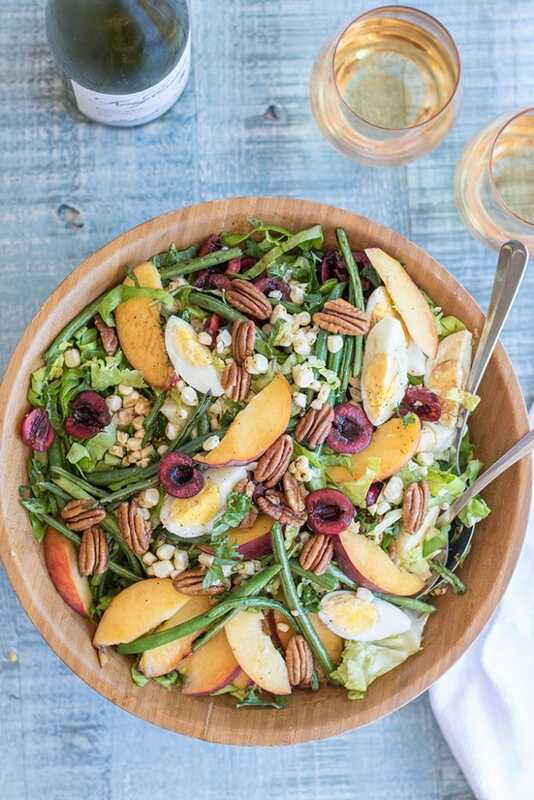 In a large salad bowl, add shredded greens, and then top with quartered hard boiled eggs, cherries, peaches, green beans, corn, basil and pecans. In a small jar. add together dressing ingredients. Pour over salad, and toss. If not serving right away, keep the dressing and pecans separate, and add right before serving. I just bought an OXO Cherry Pitter— and am in love! What have I been doing all these years without it? It makes the whole cherry eating experience so much better. I am using cherries in recipes now because it’s so easy to pit them- before, I would just eat them plain because I hated cutting them apart. I love eating salads at this time of the year, I find they lighten up the 'side' element of a dish and are so much easier to eat whilst the mercury is permanently nailed to 'to bloody hot'! Haha, yes, perfect for summer heat. That salad does look an absolute dream! 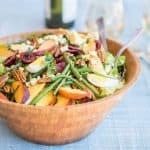 I love peaches and apricots in salads at the moment. Apricots, yum! I haven't bought any this year yet. I cannot stand a measly salad either - it has to be full of multi-textured leaves and veggies. This salad is stunning to look at - so many great colours. It's perfect. Thanks Lucy! It is such a fun combo. Yes- different textured leaves! I love salads with a ton going on. Exactly! It is always a disappointment. I've been loving fruit in salads recently, I love the cherries and peaches in this. It looks and sounds, delish! I am really focused on summer salads now (duh). I really like your addition of the cherries. Cherries are my all time favourite fruit but weirdly, I've never thought to add them to a salad. Loving all the flavours you've incorporated here. Oh this is definitely a dreamy salad, indeed. I love fruity-veggie-nuts combo. I'm putting this on my to try list. This is a must try for sure. Delicious! Thanks Natalie-- it has been a fav here this summer! I will say that is a very interesting combination of flavours in that salad. I would never have thought of adding green beans to the mix. Perfect side for summer meals. Oh, I love green beans in salads! I usually blanch them and add them to salads like a nicoise, but just quickly sauteed them for making this salad. Great salad! I have never tried it, but I feel like I need to do it very soon. It's just too delicious! You should try it Brian! It's amazing. 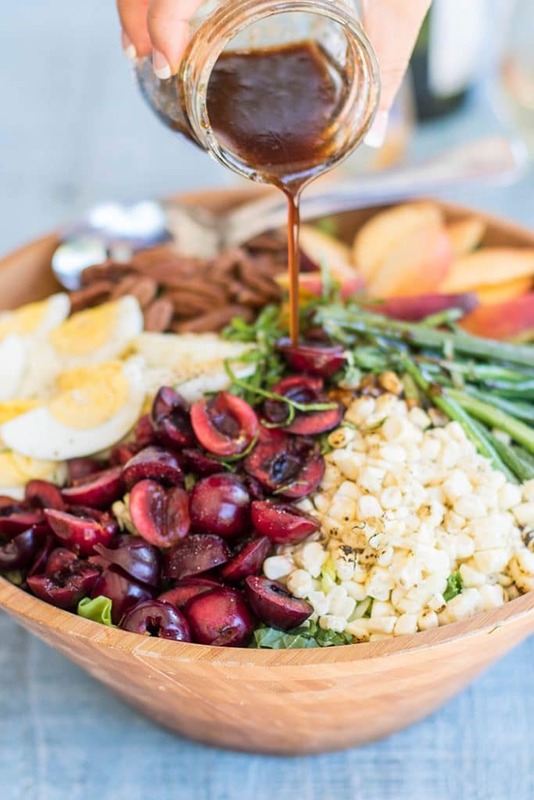 This looks like a very refreshing summer salad! We've been dealing with heat waves too, so something cool sounds heavenly. By the way, I love the catchy name and photos. I pinned it for later. Can't wait to give this a shot! Thanks Hayley! I love summer produce and this salad encompasses my favs <3 I hope you enjoy it! This salad looks amazing! I love how you've named your recipe :) So perfect!